Fourth-year U.S. Ski Team racer David Chodounsky 29, of Crested Butte, Co. carved another solid pre-Olympic performance with an eighth place in a sunny Audi FIS Alpine World Cup slalom held Sunday in Adelboden, Switz. Tied for 13th place after the opening run, the 2009 NCAA slalom champion and former NCAA slalom king skied consistently through soft rutted snow in the final run to finish one slot shy of matching his career-best World Cup finish. Minnesota-born Chodounsky, the Crested Butte Ski Academy product who captained Dartmouth College to an overall NCAA championship, is emerging as a top U.S. hope for the 2014 Winter Olympics after sitting out much of the 2012-13 season with surgery on his patella. Chodounsky has now finished in the top 15 in the last three slalom races, including a career-best seventh to close 2013 at Val d’Isere, Fra. He tied for 15th Jan. 6 at Bormio, Italy. Said Chodounsky, “Anytime you get points, it’s a good day. I feel I’m ready to consistently be challenging for the podium. It was tough and it was fast on the steepest pitch on the tour. Austrian Marcel Hirscher, 24, captured his third straight slalom win in Adelboden with his Sunday victory over Andre Myhrer, 30, of Sweden. Hirscher now leads both the slalom and giant slalom standings. He won the slalom title last winter and the season GS crown in 2012. It was the 22nd World Cup triumph for Hirscher (12 slalom, 9 giant slalom), who regained the overall World Cup lead. Two-time defending World Cup overall king Hirscher has a 675-652 edge over Norwegian Aksel Lund Svindal, 31, in what is fast becoming a two-skier race for the crown. Ted Ligety, 29, of Park City, Utah qualified 20th for the slalom final, but skied out in the second run after a fast top section. Ligety, a 19-time World Cup giant slalom winner and the 2006 Olympic combined gold medalist, remained in third place with 333 overall points. Sunday’s slalom was the first of four January slalom races to be held prior to the 2014 Olympic Winter Games. The U.S. Olympic Team for alpine will be named Jan. 26. In Saturday’s Adelboden GS on the Chuenisbaergli course, Ligety had a stroke of bad luck on his second and final run. The four-time Audi FIS Alpine World Cup giant slalom champion crashed midway down the course after holding the third-fastest time after the opening run. Poised for a podium, Ligety had his left ski skip off the snow at the instant he was turning. The mishap sent the ski flying and caused Ligety to spin down the course. The rare Ligety crash opened the door for his good friend Felix Neureuther of Germany to capture his second straight World Cup win and the first giant slalom victory for Germany since 1973. On his 29th birthday, Tim Jitloff of Reno, Nev. posted the best American finish with 24th. Nearby Wengen, Switz. will host the next men's race series with a super combined, downhill and slalom Jan. 17-19. 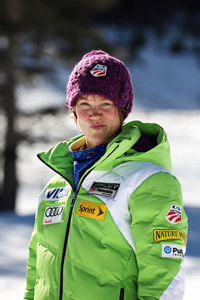 Julia Mancuso, 29, of Squaw Valley, Ca. punched her best Audi FIS Alpine World Cup downhill finish of the 2014 Olympic season with 13th place Saturday at Altenmarkt, Austria to lead four U.S. Ski Team athletes into the Zauchensee top 25. While three-time Olympic medalist Mancuso continued to gain speed toward Sochi, Elisabeth Goergl ended a two-year downhill victory drought for Austrian women with a stunning win ahead of teammate Anna Fenninger. In Sunday’s first of two combined events this season, 25-year-old Laurenne Ross of Bend, Ore. picked up the speed Sunday with 20th place. It was the only women’s super combined to be staged prior to the 2014 Olympic Winter Games in Sochi, Russia. Skiing through a thick patch of fog in the opening super G, Ross was 24th in the first run. The weather cleared for the final allowing Marie-Michele Gagnon of Canada to capture the first Audi FIS Alpine World Cup victory of her career. Third in Saturday’s downhill, Germany’s Maria Hoefl-Riesch, 29, added 120 points for the weekend and stayed ahead in the overall World Cup women’s race 731-709 over Fenninger. Hoefl-Riesch is the downhill leader. Liechtenstein’s Tina Weirather, 24, stands third in the overall with 673 and U.S. technical star Mikaela Shiffrin is fifth with 514. The women move to Cortina d’Ampezzo, Italy for downhill and super giant slalom Jan. 17-19.